Everyone seems to be well away how soliciting it is to be a nurse. We are talking about long shifts standing up, walking and even climbing stairs. It is not a typical type of job and it takes a lot of dedication. It is a difficult job but very rewarding. Since nurses spend so much time standing and walking, getting the right type of shoes is essential. They might not be the prettiest shoes, but they are essential. A good pair of clog shoes can prevent back and leg pain and they offer a certain degree of protection. A good pair of shoes for nurses do not have to be expensive. The only problem with them is that the vast majority of clog shoes are quite unappealing in terms of design. There are some shoes that can be deemed wearable and, fortunately, they got selected for our list. To keep things short, let us get right into our list of the top 10 best shoes for nurses in 2019. Simplicity is what makes the Sanita PU clog shoes more comfortable and easy to wear. The shoes made mainly out of PU leather that will prove to be durable enough and a soft inner sole which will significantly improve comfort. The shoes are made out of polyurethane with a hard plastic frame. The hard shell protects the foot from items that would be dropped accidentally onto it. To make them comfortable, the platform is not as thick as with other shoes and measures just 0.75 inches. 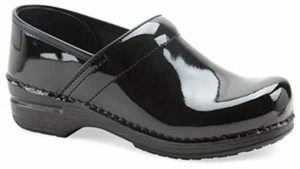 Cherokee Harmony Step-in shoes have the great advantage of being practical and convenient. They are very easy to put on as they have a step-in design and they are quite comfortable with all the interior padding, especially around the heel area. As a material, Cherokee used PU leather but it is scratch resistant and reliable. The platform measures 0.5 inches which are thick enough but also maintains the shoe lightweight compared to other clogs. 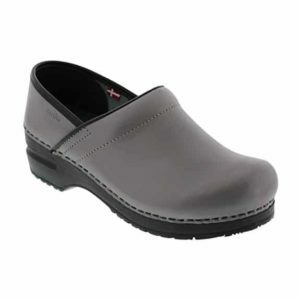 Anywear Zone work shoes are an excellent pair of clog shoes that are focused on delivering comfort and practicality. The shoes also come in a wide range of colors and patterns. Some are more inspired than others. 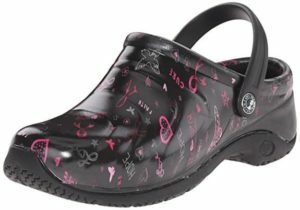 Like most other clogs, they are made using synthetic leather. 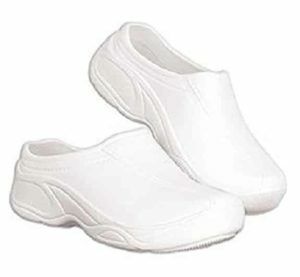 The sole is also synthetic, but the shoes are scratch-resistant and long-lasting, which will help nurses that need to have them on for many hours. 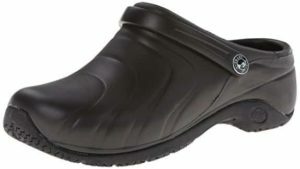 Dansko Pro XP clog shoes stand out a bit when compared to other models mainly because they have a more modern design. They tend to look like regular shoes but offer better comfort. The padded instep collar makes them bearable even after staying with them on for many hours at a time. To make them more durable, the shoes have been made using genuine leather. The sole is made out of a soft rubber while the instep collar has been padded for extra comfort. To improve safety, the bottom side of the sole has been fitted with an anti-slip surface. As far as the design goes, the shoes are available in several different models, with the glossy black version being the most popular one. They are not the lightest shoes, but they are comfortable enough. 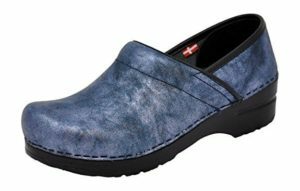 AnyWear Zone clog shoes are a great option for the ones that have a tight budget or do not care all that much about the design of their work shoes. They are made to be comfortable with little regards to anything else. The shoes have a design that makes them comparable to running shoes. They are made entirely out of rubber including the sole. The sole itself has an anti-slip finish while the insole is molded and made from a soft material. Even if the clogs are available in a wide range of colors, their design will not impress anyone. Their biggest advantage is how lightweight they are and the comfort they offer. The Algeria Keli professional shoes have a rather interesting design. 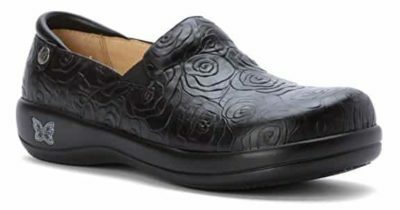 They look like regular clog shoes but the leather has embossed roses onto them. The black leather and the roses gives them a modern and appealing look. For the shoes, Algeria used genuine leather. Genuine leather is the better choice for durability. They are that not lightweight, but they are still comfortable to wear. Plenty of memory foam has been used for the insole to provide better cushioning. The shoes are available with multiple other patterns. All of them are made using the same premium materials and offer a good degree of safety and comfort. The rubber outsole will prevent them from slipping and putting them on takes just a couple of seconds. 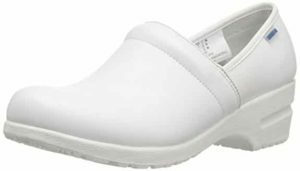 Natural Uniforms Ultralite clogs are some of the most comfortable work shoes available. Their main advantage is the lightweight construction. They do not use any kind of leather. Instead they are made from a light flexible plastic that also provide a bit of cushioning. To be more precise, the shoes are made from EVA foam. The material is known to be bacteria resistant and quite soft. The sole is just as safe while the outer sole has a slip-resistant surface. The design of the shoes is quite basic. They look like every standard pair of clog shoes. Because they are lightweight and made from a foam material, the shoes can be worn for an entire day without feeling uncomfortable in any way. Sanita professional Cabrio clog shoes have proved to be extremely durable especially in difficult work conditions. They were designed to survive wear and tear by using genuine leather and a flexible but reliable outer sole. Like most work clogs, the shoes have a slip-resistant outer sole. The interior has a soft foam padding and has a classic roomy toe box. Slipping them on takes just a couple of seconds while the flexible PU sole ensures they are comfortable especially for the ones that work long shifts. Even if they are not the lightest clogs, they are remarkably comfortable. They do a very good job at absorbing shocks and have an anatomically-shaped footbed that makes it even more comfortable to walk in them. 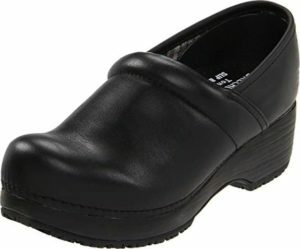 Skechers for Work clog shoes is a popular pick amongst nurses and the ones that work in similar environments. The shoes do not have the prettiest design but they are functional and quite durable. The shoes are made mostly out of genuine leather. Their sole is made out of rubber while the outer sole has an anti-slip surface. The mid-sole is made out of a flexible shock-absorbing material while the inside has plenty of cushioning. As far as comfort goes, the shoes offer plenty of support and cushioning. Their only downside is that they are not very lightweight. Using genuine leather does add to their overall weight. So does the 1-inch platform but at the same time, it offers better protection and durability. 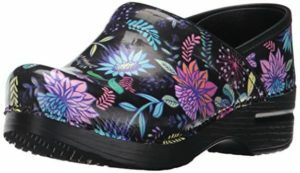 Dansko professional clog shoes may not be the most affordable work shoes on our list but they are surely popular. What makes them such attractive is their design. They come with a wildflower print on the leather which is that extra element that makes them stand out. For the construction of the shoe, only genuine leather has been used. The sole is made out of polyurethane which offers a bit of cushioning, shock absorption and are usually either than regular rubber soles. The platform measures 0.75 inches which are quite decent while the outer sole has an anti-slip surface. The toe box of the clog shoes is quite roomy so that they can offer both protection and comfort. The manufacturers made the shoe available in a wide selection of colors and patterns. 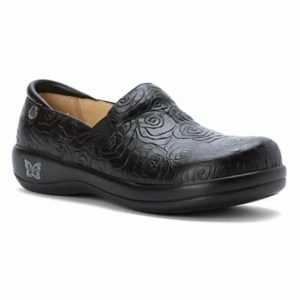 Clog shoes are the only kind of shoes that nurses can wear comfortably during a long shift. There is no debate about it and fortunately, there is no shortage when it comes to clogging shoe model diversity. There are more than enough options on the market. As not all shoes are created equal, there are some things that differentiate various types of clog shoes. It takes a bit of research but at the same time, it is important to keep in mind some essential aspects. Weight: Clog shoes can be quite heavy depending on how they are built, and the materials used. Generally, shoes with polyurethane soles are lighter. Genuine leather also adds a bit of weight when compared to PU leather. At the same time, weight might not matter all that much for some, but it can be important especially for nurses that walk a lot. Genuine or PU Leather: Genuine leather has the great advantage of being more durable than PU leather. PU leather is known to be lighter thus shoes with this type of leather can feel a bit more comfortable, at least when it comes to the total weight of the shoe. Design: Even if the design of a pair of work shoes should not matter, it is something that a lot of people think about when looking for clogs. Clog shoes usually have the same shape. The best bet is to look at different models as they might have different patterns and small design variations. All shoes for nurses need to fill a functional purpose first before anything. Surely, nobody wants to wear an ugly pair of shoes but when it comes walking and standing for many hours at a time, comfort becomes essential. A good pair of clog shoes has a generous toe box and a shock-absorbing sole. They need to have padding and not to be too heavy. Our picks for the top 10 list contains good variations of clog shoes. Any pair from the list is a great pick but in the end, it is all about personal preference especially when it comes to shoes.